Few, if any, conclusions can be drawn from a spring football game. 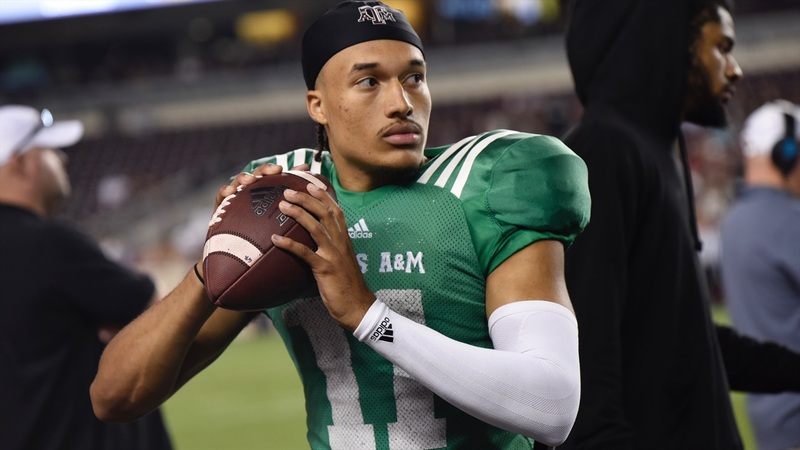 But, if there were conclusions to be drawn from Friday night’s Texas A&M Maroon-White Game, they are that quarterback Kellen Mond is improving, Zach Calzada would have the edge in the competition to be Mond’s backup, the pass game is strong and Jacob Kibodi is a legitimate option at running back. Oh yeah...and Braden Mann can really punt. Aside from that, Moses Reynolds grabbed two interceptions, the tight end position was still be productive and center Ryan McCollum was named the spring Offensive MVP and defensive tackle Justin Madubuike was named Defensive MVP. Mond threw for 172 yards, which included touchdown passes of 25 yards to receiver Camron Buckley and 29 yards to tight end Glenn Beal to lead the White team to a 17-14 victory at Kyle Field. That outcome, however, was of secondary importance to the progress that was demonstrated at several key areas – starting with Mond. Mond’s first pass was intercepted by Clifford Chattman, but he responded by completing his next nine passes in a row. Fisher was just as impressed with Mond’s performance before the snap. Mond said he evaluated his performance from last season to see where he needed to make strides this spring. “I thought I was on my toes too much and kind of hopping around (last year),” he said. “This whole spring I was trying to focus on my base and get the ball out a little bit quicker. Continue to be more consistent. Everything as a whole to be a great quarterback. Connor Blumrick, James Foster and Zach Calzada have been vying for the role of Mond’s backup during a competitive spring. Calzada completed 8 of 21 attempts for 139 yards and a 31-yard touchdown pass to freshman tight end Baylor Cupp. Fisher said that showing did not necessarily mean Calzada has an edge in the competition even though Blumrick passed for just 19 yards and Foster threw for 67. Fisher said Blumrick’s game was compromised by the no-hits-on-the-quarterbacks rule. “I’ll wait and look at the film and then we’ll see where he’s at and what’s going on there,” Fisher said. “He (Calzada) made some nice throws today. You see his talent. The quarterbacks were tagged down for sacks five times. Jayden Peevy notched two. Buddy Johnson, Mohamed Diallo and Michael Clemson were also credited with sacks. Not only were the quarterbacks often under pressure, they were without starting receivers Quartney Davis, Kendrick Rogers as well as Rashauud Paul and Hezekiah Jones, who sat out with minor injuries. Baylor Cupp is one of the talented young freshman who hopes to make an immediate impact. Their absence made the tight ends that much more attractive. A year ago Jace Sternberger was the star of the Maroon-White game with eight catches for 144 yards and two touchdowns. No individual stood out like that, though Cupp and Beal combined for 10 catches for 158 yards and two touchdowns. The Aggies were also without running backs Jashaun Corbin and Vernon Jackson, who missed the game with injuries, and Cordarrian Richardson, who went home to Florida for a funeral. Jackson’s injury, which is rumored to involve his neck, is most worrisome. Fisher said Jackson will be examined by a specialist next week. With them out, Kibodi stepped in to rush for 106 yards on 20 carries and a 3-yard touchdown run. Overall, Fisher said he was encouraged by what he saw from his players over the 15-practice spring session and is eager to move forward. “Spring is about finding out who you think can play, what they think they can do, where they’re at in their development and then get them ready in the summer and fall to play,” Fisher said. Kibodi could be a beast of a sleeper. got to detail what Mann did, Olin! one of the highlights was a 52 yard punt that went out of bounds at the 3 yard line. There's no reason he should be considered a sleeper. I've been saying this for two years. I can't for the life of me figure out why he hasn't been in the regular rotation. Every time he sees action, he plays balls out. He's big, fast, and shifty. I hope he sees the field a bunch this year. Can't wait to be proven right on this one. It's been the biggest head scratcher for the past two seasons. Exactly. Hardly anyone talks about him but when he plays he plain balls out. I think it's easy to understand why he didn't get much PT last year with Williams and Corbin on the roster. I thought Prince did well at running back too. "the tight end position was still be"
"8 of 21" This should not cinch a back up role. I agree, but several balls were catchable. I do think he'll be a good QB one day.